Well I’ve done my duty and submitted my game descriptions for Furance games convention in October. Amoungst them is this game for Monkey, featuring the four main characters from the book. Five pilgrims on their way to India to pick up the lost scrolls of Buddhist cannon to bring enlightenment to a China beset by social ills, find their way blocked by a mountain range. Their only way through is a mountain pass which goes through a huge statue of Buddha himself! A winding stair leads up from a village nestled by Buddha’s feet, through temples and chambers carved out the rock in Buddha’s Lungs and heart, all the way up to the deity’s brow where the road continues onwards to India. Tripitaka, the Priest who leads the expedition wants to pay his respects at the many temples that line the winding stairs to Buddha’s brow. Monkey is restless and after a long boring journey looks for opportunities for mischief. Sandy is worried that all is not what it seems and despite the smiling local people and happy monks. Pigsy hungry and thirsty after the trek through the desert just wants to gorge himself on food, wine and introduce himself to the pretty local women who live in the village built at Buddha’s feet. Horse, being a shapeshifted Dragon Prince transformed into a stead for Tripitaka by the Goddess Kuan Yin momentarily wishes that he could transform back into a dragon and fly over the mountain, but is quietly resigned to plodding up all those stairs. Come play a quick story inspired by the Chinese classic “Journey to the West”, using the four main characters from the book. Knowledge of the system, a straightforward fun set of rules using a deck of playing cards, or setting not required. Help celebrate 10 years of games of Monkey at Furnace, which saw the first convention game in its inaugural year! 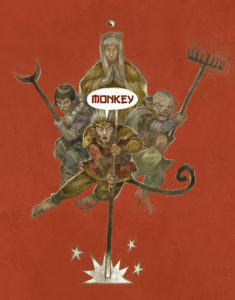 Tags: Monkey Magic!, Comedy, Kung-Fu Action, MGF! Monkey is getting a second expanded edition with all new art. Work has already started. The system is going to be streamlined and tweaked. No more large hands of cards to add up. More clarity about whose turn it is. Rules for who holds the spotlight at the beginning of a scene so quiet players don’t get drowned out by the loud mouths. I’m currently gearing up to run a home campaign of the Game, so expect some actual play reports. Once my obligations towards the current Crypts and Things Kickstarter have been fulfilled and Monkey 2nd Incarnation has a 1st draft I’ll be looking to run a quick and focused Kickstarter for the game. 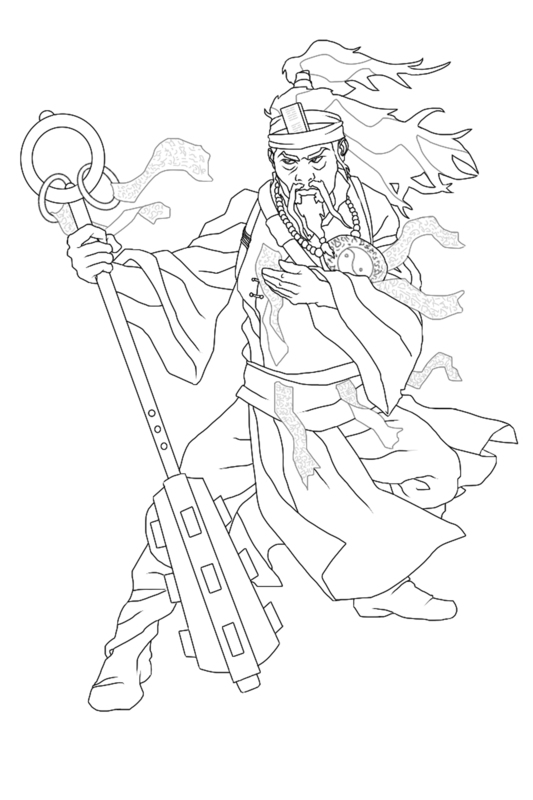 Which as well as funding art and additional content as stretch goals (rules for mortals in the core rules for example), will feature the previously announced Ministry of Thunder mini-campaign as a stretch goal. For more news about the game’s development follow this blog. 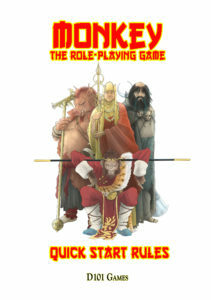 In the meantime if you are curious about the first incarnation of the game, it is on sale via DriveThruRPG.com.